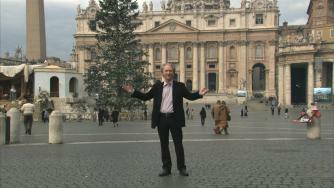 Bill Maher outside the Vatican City in RELIGULOUS. "The other guys are selling certainty, not me." So says Bill Maher in "Religulous," one man's screedy dissection of organized religion, its fundamentalist excesses and what Maher sees as the planet-threatening evils fomented in the name of righteousness. It's a fairly entertaining bash, with a travelogue vibe established by director Larry Charles ("Borat"). It's also smug as all hell. No surprise there, given Maher's well-honed argumentative persona on his "Real Time" HBO series. Yet even if you share Maher's skepticism on his subject, you may wish he'd set up his straight men and straight women in a way that doesn't merely score the cheapest possible laughs, or return, again and again, to Maher's eye-rolling over literalist interpretations of the Bible (Adam and Eve, talking snake, Jonah and the whale, et al.). The movie begins and ends in Megiddo, Israel, Ground Zero for the battle of the end times, according to Revelations. Maher, who grew up Catholic with a Catholic father and a Jewish mother (Judaism wasn't discussed, he says, until his father broke from the church over the birth-control issue), goes after a variety of fervent believers of various religions, from Muslims to Christians to Jews to ex-Jews to Mormons to ex-Mormons. He visits a truckers' chapel in North Carolina, disingenuously muttering, "I'm just asking questions" when one of the long-haul drivers walks off the interview, offended. He moves on to attractions Sacha Baron Cohen's Borat might've enjoyed, including the Creation Museum of Petersburg, Ky., or the Christian theme park known as Holy Land Experience in Orlando, where Maher spars with the actor playing Jesus in an outdoor "Passion" play. This is squirm humor, wrapped in a dire polemic. No less than the evangelical Christian extremists and Islamic jihadists who come under attack in "Religulous," Maher foments an apocalyptic vision of the planet's future. "Religion must die in order for mankind to live," he concludes, flatly. America's staggering percentage of evolution non-believers aside, this is a fine time for a film such as "Religulous," which is peppered with sound bites from, among others, John McCain, supporting what he characterizes as the American constitutional framework for "a Christian nation." About half of the movie works in its snide, hit-and-run way. The other half throws more and more darts at the same balloon, long after it pops. Religulous MPAA rating: R (for some language and sexual material). Directed by Larry Charles; photographed by Anthony Hardwick; edited by Jeff Groth, Christian Kinnard and Jeffrey M. Werner; produced by Jonah Smith, Palmer West and Bill Maher. A Lionsgate release. About the Documentary Movie "Religulous"
RELIGULOUS follows comedian Bill Maher ("Real Time with Bill Maher," "Politically Incorrect") as he travels to religious sites around the world to interview a broad spectrum of believers about God and religion. Known for his astute analytical skills and for his commitment to never pulling a punch, Maher applies his characteristic honesty and irreverent wit to the question of faith, bringing us on an uproarious and provocative spiritual journey. Directed by Larry Charles (BORAT: CULTURAL LEARNINGS OF AMERICA FOR MAKE BENEFIT GLORIOUS NATION OF KAZAKHSTAN, HBO's "Curb Your Enthusiasm"), RELIGULOUS will mark Charles' first feature project since the critically acclaimed, wildly successful BORAT. Jonah Smith and Palmer West of Thousand Words (A SCANNER DARKLY, REQUIEM FOR A DREAM) and Bill Maher are producing. About the Film Makers "Religulous"
For the last fifteen years, Bill Maher has set the boundaries of where funny, political talk can go on American television. First on "Politically Incorrect" (Comedy Central, ABC, 1993-2002), and for the last six years on HBO's "Real Time," Maher's combination of unflinching honesty and big laughs have garnered him twenty-one Emmy nominations. And in October of 2008 this same combination will be on display in the movies when Maher's uproarious and unprecedented swipe at organized religion, RELIGULOUS, directed by Larry Charles (BORAT) hits theaters. In addition to his television program - which has featured such regular visitors as John Edwards, Ben Affleck, Robin Williams, Arianna Huffington, Alec Baldwin and Michael Moore - Maher has written four bestsellers: True Story, Does Anybody Have a Problem with That? Politically Incorrect's Greatest Hits, When You Ride Alone, You Ride with Bin Laden and most recently, New Rules: Polite Musings from a Timid Observer. Maher started his career as a stand-up comedian in 1979, and still performs at least fifty dates a year in Las Vegas and in sold out theaters all across the country. Two of his eight stand-up specials for HBO - 2007's "The Decider" and 2005's "I'm Swiss" - have been nominated for Emmy� awards. Larry Charles has served as writer, producer, supervising producer, executive producer, and director on some of film and television's most successful comedies, including BORAT, "Seinfeld," "Curb Your Enthusiasm," and "Entourage." Throughout his career, he has won two Emmys�, a Golden Globe� and a Peabody Award and received multiple Emmy�, DGA, WGA, and Golden Globe� nominations. His controversial theatrical directorial debut, MASKED & ANONYMOUS, co-written with and starring Bob Dylan and featuring an all star cast including Jeff Bridges, Jessica Lange, John Goodman, Luke Wilson, Penelope Cruz, Ed Harris, Val Kilmer and Mickey Rourke, was the 2003 centerpiece premiere at the Sundance Film Festival. Charles has been profiled in numerous publications and periodicals, including W Magazine and Esquire. Palmer West and Jonah Smith's production shingle, Thousand Words, is devoted to identifying unique voices: stories and storytellers whose visions invent rather than abide by cinematic convention. Founded by West in 1998, Thousand Words is a privately owned, Los Angeles-based development, production and finance entity with a revolving credit line through JP Morgan, which affords the company the ability to develop, finance and produce films both with and without domestic distribution commitments. West was born and raised in Philadelphia and moved to New York City upon graduating from the University of Montana. Smith, raised in Connecticut, graduated from NYU Film School and later co-executive produced PI, Darren Aronofsky's film debut. West and Smith both reside in Los Angeles. Under the Thousand Words shingle, West and Smith have produced Darren Aronofsky's REQUIEM FOR A DREAM, Richard Linklater's WAKING LIFE and A SCANNER DARKLY, THE UNITED STATES OF LELAND and THE CLEARING, starring Robert Redford.